I am trying to create the auditory emotional valence rating task. How can I let my participant replay the auditory stimuli if they want to? The details of course depend on how your experiment works. 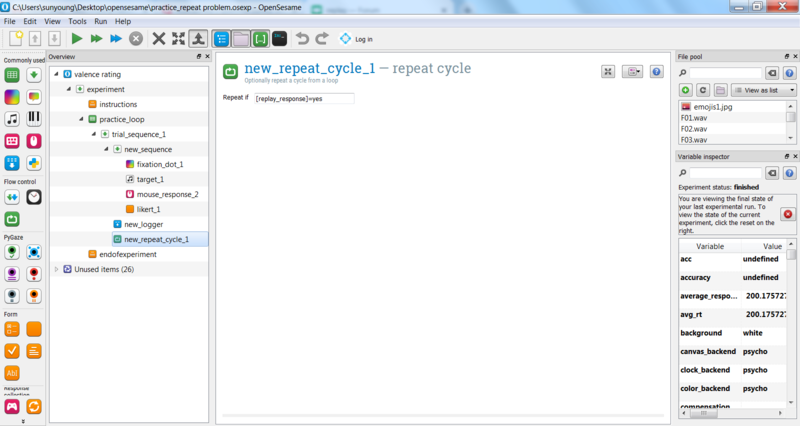 But in very general terms, you could take a look at the repeat_cycle item, which allows you to repeat a cycle from a loop whenever a particular criterion is met, such as when the participant has given a particular response. I've tried the repeat cycle, but I might have put it in a wrong place. Sometime the word is replayed, but sometime is not. > I've tried the repeat cycle, but I might have put it in a wrong place. Sometime the word is replayed, but sometime is not. When exactly is the word replayed, and when is it not? If you look in the variable inspector, what happens to the replay_response variable? Trial A is never repeated. When trial A appears first and then trial B appears, trial B can be repeated. When trial B appears first, the repeat button just leads to the end of experiment, skipping trial A.
the replay_response variable says yes for the value in the variable inspector.